Odessa, Mo. 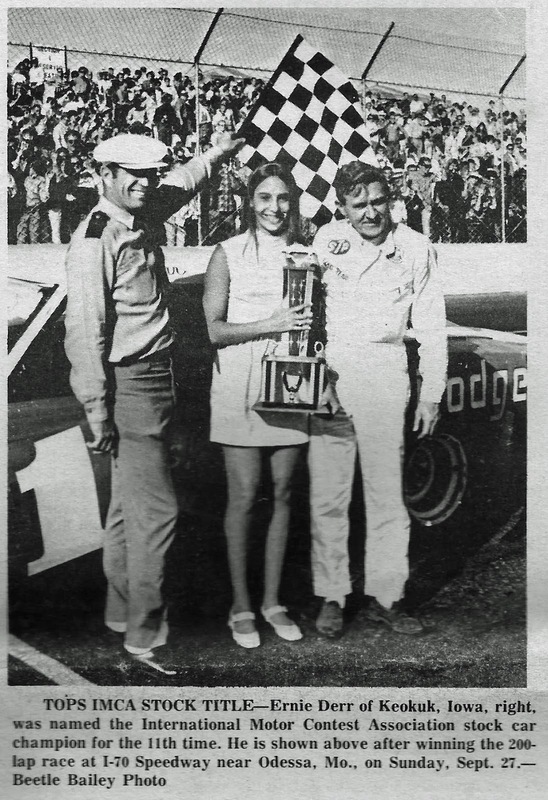 (September 27, 1970) – Ernie Derr added another win to his ever-growing list of International Motor Contest Association victories with a win in the 200-lap new model stock car race in front of 7,500 race fans. Derr, from Keokuk, Iowa, battled some of the toughest competition ever on the high banked half-mile asphalt oval when he encountered a strong group of local drivers ready to head off the charge of IMCA pilots. 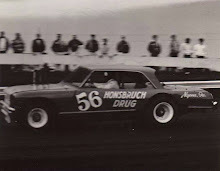 Dave Wall of Kansas City qualified his 1969 Chevrolet one-hundredth of a second faster than Derr in time trials and earned $100 for his efforts with a time of 20.06 seconds. 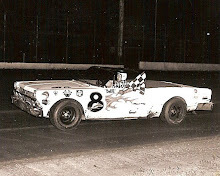 Derr brought his ’69 Dodge around the oval in 20.07 seconds and Fred Whisler of Liberty, Mo., took his 1970 Ford around the track in 20.21 seconds. 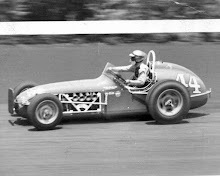 Irv Janey of Cedar Rapids, Iowa, jumped into the lead at the start of the race with polesitter Lewis Taylor of Shawnee, Kan., in hot pursuit. Later, Wall would move into the runner-up position as Derr dropped back into seventh position. 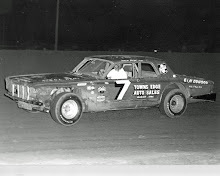 Early in the race, Keokuk’s Ron Hutcherson would give up his fourth spot as he would pull into the pits with the clutch going out on his ’70 Ford Torino. 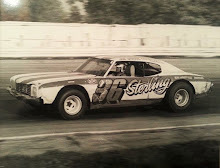 He would finish 23rd out of the 28 cars. Wall would eventually get around Janey for the top spot with Derr now moving up to second. The two drivers staged a battle all their own, as they lapped the entire field and continued to set a fast pace. On a yellow flag, following an accident, Derr would get in and out of the pits without losing any time. Wall would pit later on another caution period but would get caught in the pits when the green flag came back out. Derr, running the high groove on the track, would continue a torrid pace, winning the race handily.